As promised in my 100th post, we start June with the all-new regular feature: Guest Tuesday. Today, I am very happy to introduce a blogger whom I met via the A-Z challenge, 2014. She had written a post on Vidya Sury‘s blog, about Sharing your heart smile with the world. Reading the post gave me goosebumps, since I found myself nodding along with every word. She touched me with her writing and I found myself reaching out to her, to discuss the idea of happiness. It is my privilege and honour to host the epitome of love and one whose name fits her like a glove. Please welcome Joy Holland, who will tell you more about herself in her own words. Thank you, Joy, for agreeing so readily to write this post for my blog. Joy Holland is an Empathic Intuitive Guide, Energy and Clarity Facilitator who shares the gift of presence to magnify your inner brilliance. Joy is the founder of Facets of Joy. com– a community where exploration is encouraged and heart whispers are affirmed and supported. You are worthy and deserving of living a life full of peace, joy, love, wonder, awe, delight and possibility. Joy invites you to experience the feeling of inner peace and possibility, even while the heart continues to heal and grow. She offers a variety of personal sessions and e-courses to encourage and support you on your heart-path. We each want to feel loved and appreciated as we connect with others. Regardless of the label we are wearing as we connect – parent, friend, child, student, sibling, spouse or significant other – we intend for our relationships to feel enlivening and fulfilling. When we speak we wish to be heard, understood, accepted and appreciated. We also want the person we are connecting with to feel the same. Have you ever had the experience of feeling like you had something truly meaningful and significant to share with a person but, as you spoke, you noticed that their attention was on something that wasn’t you? No matter how excited you originally were to speak, your energy deflates and you feel insignificant and small. It’s likely that you feel neither loved nor appreciated. It’s also likely that you will be less enthusiastic about participating in future conversations with that person, even if they invite you to share. Because I believe that what we focus upon grows, let’s flip the example around and explore a positive experience of connection. You have something really important to say and the person you wish to share it with looks you in the eye, is in a relaxed position ready to receive whatever it is you wish to say and you feel so comfortable you speak straight from your heart. As you speak, the person encourages you to continue with gestures such as nodding in agreement and facial expressions that convey empathy. They don’t interrupt, they keep on listening. You talk on, often joyfully sharing far more than you intended to. This is the power of presence to active listening. You feel peace, love, gratitude. Your bond is strengthened. Your heart is happy. And, you look forward to speaking together again. How refreshing! You can clearly see how active listening can be a valuable communication tool. Simply by making the time to be fully present to what is being shared – as the speaker and as the listener – you are adding value to the relationship. You are practicing being unconditional love! Often, when we think of unconditional love, our minds create excuses and doubt as to ‘how’ we can experience this energy in our connections, in daily life. Unconditional love feels like an energy reserved for those in ‘special circumstances’, not something we can access today, as we are. Yet, this simple example of active listening shows how easy it can be to share unconditional love. It is important to move energy while connecting. The intention is to move energy through our bodies and through the room to keep the energy fresh and the conversation ‘flowing’. Sometimes, a challenge with active listening is that it requires us to be a bit vulnerable as we share from heart space. To listen without judgment or criticism even if what is being presented is something we don’t agree with, touches us in a tender space, or is unfamiliar and requires engaging mind in learning something new. These tips offer ways to keep energy flowing, even if we feel vulnerable. 1. Have access to plenty of fresh air. This serves to move energy through the space and to enliven the energy that is in it. 2. Ensure there is fresh water to drink. This is an energetic way of ‘tapping into flow’ while also moving energy through the body and refreshing energy in it. 3. Periodically take a deep cleansing breath – restoring energy and ‘clearing the air’. 1. Meet in a space that is comfortable and familiar to the listener and speaker. 2. Agree upon a specific block of time for the conversation. 3. Remove potential distractions – such as cell phones and electronic devices. 5. Take the time to move energy, using the tips above. 6. Receive in the meaning of the words being shared as well as the feeling being conveyed. 7. At the conclusion of the conversation, thank each other for the time, energy and presence that was shared. As you read through these tips, please remember that you can customize them to any situation. Active listening can be done spontaneously; it doesn’t ‘need to be a formal, planned’ process. If you are engaged in something and a loved one wishes to speak, you may stop what you are doing and begin the process of active listening or you may explain that you may be fully present for the conversation at a future time. What I find fun about active listening is that it is a gift that can be shared with any person at any time. Sometimes we think of gifts as ‘costing a lot of money’ or something that ‘might not fit the person’s interests’; active listening is a gift that is priceless and custom to each person. I would love to know, what is your experience with active listening? Is this something familiar and comfortable to you or is this something new for you to explore? If you practice active listening, do you have any tips to share with us? I have a glow of happiness to think I am partially the reason why you are here, Joy! 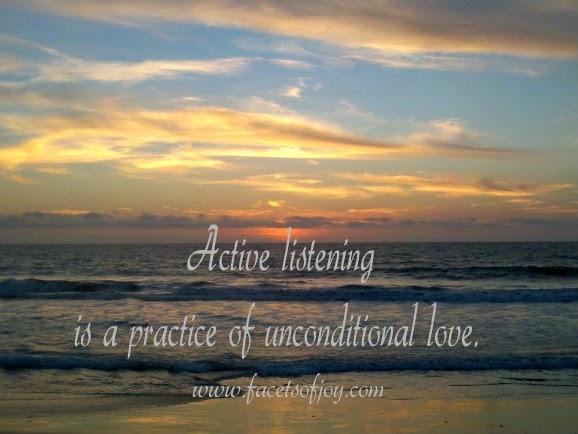 Active listening is indeed a practice of unconditional love, for do we not pay full attention to what the ones we love are saying? I have learned to create the ambiance to help the person to listen to what I am saying when I have to share something with them. Why blame them for not listening by talking to them when they've got something else on their mind? One of the ways I do this is prepare them – tell them I've got something to share with them and let that sink in. They are usually proactive about making the time to listen. This reminds me of something funny. During my sales career, I had the reputation of looking people in the eye steadily while speaking to them. I never realized how effective this was, until someone pointed it out at a training session. The importance of eye-contact and its implications. Well, fact is, I am short sighted and tend to stare-focus a little 😀 Worked in my favor though and the positive feedback helped. Sharing, listening brings us all closer in love. Thanks for such a fabulous post, Joy! Shailaja, thanks for the honorable mention! Indeed an interesting guest post, Joy and Shailaja. Listening is an art not many have mastered but could benefit from if they work on it. I myself have been constantly trying to work on it.Thanks for the wonderful tips, Joy. A very interesting post Shailaja, and wonderfully written, Joy! Due to some personal experience with bad listeners, I have always been a believer in active listening though I hadn't consciously applied this term to the habit. So much wisdom and good advice here! I need to learn to be a better active listener – putting away my devices and concentrating fully on the conversation at hand would be a good start. Thank you for sharing these thoughts. Great advice. Sometimes I have to remind myself to really listen to my husband and kids. It is hard to sometimes trying to juggle so many hats. Some years back, I got to something called being present in present. That was nothing but being actively present and remain connected to the current state. Very often we get drifted by the distractions which does not help oneself and other in the surroundings. Very good advices and simple enough to follow through. Thanks Joy and Shailaja. Vidya, you always make me smile. I am just picturing you with the stare-focus 🙂 Glad it worked to your advantage! You are more than welcome for the mention. I should thank you for letting me know about Joy! Beloo, I somehow doubt you would be the kind who interrupts another! I am, however, very glad that this post resonates with you 🙂 Thank you for visiting and sharing. Such a wonderful term, is it not? I myself heard of it for the first time through Joy and am so grateful! Laurel, I hear you! I think I am guilty of that habit too. We really need to step away from too much technology. Kathy, I completely agree with you. I am guilty of trying to do too much at the same time. Time to reassess my priorities. Absolutely agree, Jayanta. Thanks for reading. LISTEN and SILENT are anagrams, two different words with interlinked in a strange way. If one is silent then one can listen to another. If both the parties are talking then no one is listening to one another. Listening is like meditation . That is a beautiful message, Kalpana! I never realised it until the moment that I read it here. In order to listen , one must be silent. That is so powerful! Its the GIFT of Presence ! which is so very important, when we are listening. Listening is an act of love, and its not easy to listen, when our minds are preoccupied. The ambience and the space that we create is very important for listening. Working as a counselor – I follow everything to ensure that I listen with love to my students who come with various problems. I am still learning to integrate this at home – listening to my husband and my daughter. Thanks joy and shailaja for sharing this !